I am an experienced gardener based in North Queensland, Australia, and have, in recent years, developed a love (my wife would call it an obsession!) 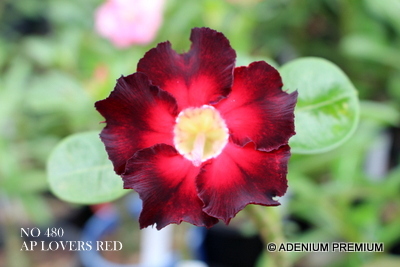 for, and expertise in, growing Adeniums (Adenium obesum), commonly called the 'Desert Rose'. My Adeniums are grown locally and reared lovingly. I have grown many painstakingly from seed and then used specialised grafting techniques to rear plants producing specific and desirable coloured flowers (see more about colours). I have spent many years grafting a wide variety of plants from fruit trees to eggplants etc. I learnt the art of grafting from my father who was a professional grafter in Europe, and now use a variety of techniques including flat grafts, V grafts and side grafts. As well as growing Adeniums for my own pleasure, I am also happy to grow Adeniums for others to enjoy. Please take a look at the pictures of my beautiful Adeniums and, if you like the look of any of them, don-t hesitate to email me and I will be happy to discuss how I can help you. Each flower featured on my site is numbered, so please remember to quote the number of the flower you are interested in when you contact me.